When the day that seemed so remote in the future had finally arrived, a mix of emotions sifted through my body. This made it difficult to figure out what exactly it was that I was feeling. However one thing I was sure of, this was the RIGHT choice. Heading to Bali alone for a month would be life changing (and yes, I mean for the better). Taking off from the beautiful city I call home, San Francisco, MY journey began. The gorgeous beach town of Canggu immediately stole my heart. Its booming streets screamed with honks from cars and scooters, dogs scampered everywhere with no concern of being trampled by automotives, and salty ocean air whisked by my face. However, what impressed me the most was the dedication, artwork and love for culture that glimmered on each street. Hand woven bamboo arches arched over the streets in a delicate pattern; colorful, vibrant and creatively decorated. I spent the first few days taking it slow (the jet lag hit me harder than I expected). I learned how to scooter, and it's a miracle I survived, (maybe take a couple lessons first) but scootering is the easiest and most efficient way to get around Bali. I would spend my days scootering for miles through rice fields watching locals tend to the rice, knee deep in swamp water, yet not seeming to care about anything else in the world. Pure peace radiated through the land making it hard for me to prevent the ear to ear smile that was plastered on my face. I looked like a kid who was just told that they can have cake for breakfast. I probably even looked a little looney, but it didn’t matter. After all, I was living my dream. Canggu, a Vegan surfers dream, felt like home after just one week. 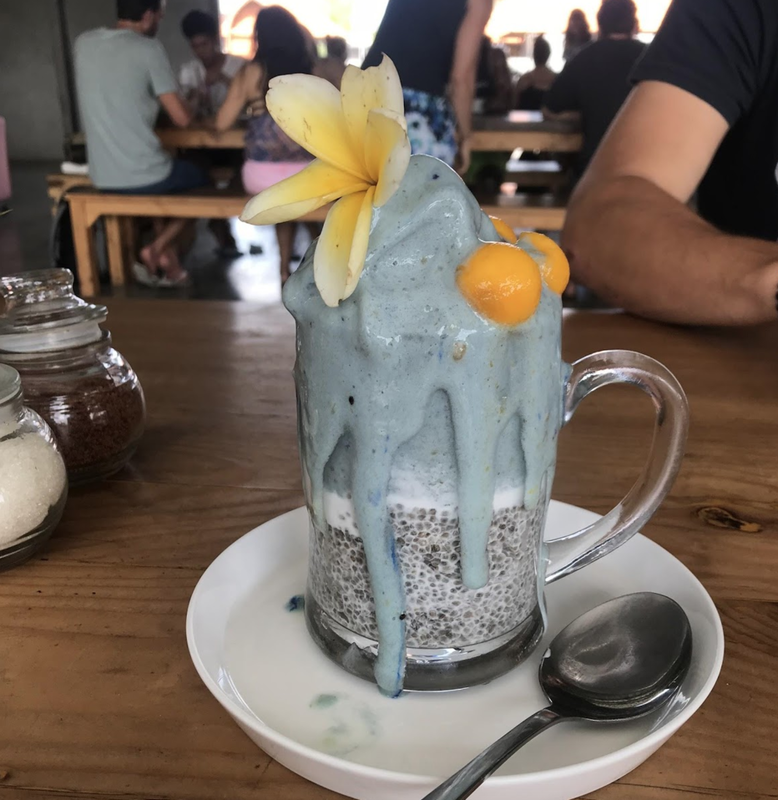 Waking up and filling my body with yummy vegan goodness such as this blue spiralina chia cup from the popular tourist cafe "Crate", before scootering off to the local beach, Old Mans, for a morning surf, became a routine; a lifestyle I could get used to. I mean, who doesn't want to live the island life. I stared out the window of a small white cabin awe at Ubud's culture as I entered the town. Offerings composed of flowers and food bundled in a woven banana leaf-lined each sidewalk. Making these offerings is a daily activity locals partake in Hindu culture. I caught myself laughing out loud (quickly receiving a very strange look from my driver) as I watched two puppies wrestle on the side of the road. I felt a sense of community before even stepping foot in Ubud. Ubud Market: my first destination in Ubud was the world famous market. Overflowing stalls lined streets for miles. People could be heard shouting, laughing, and haggling in every language as all our goal was all to buy a handmade Indonesian product for less than they asked. Let's just say the Indonesian stall owners have no shame in being slightly aggressive. I mean after all, they are just trying to make money (aren't we all? :p). However, I felt happiness radiate from the hard-working locals who stood on the side of the road hoping to sell a piece of fruit or a painting. I spent the rest of the week exploring nature as Ubud is a sea of hidden beauty. From running away from vicious monkeys to swimming through waterfalls, the week flew by. Now you might have thought I left out the most important detail, "Caroline didn't you visit the Tegallalang Rice Fields?". YES, OF COURSE, I was just saving it for this special paragraph of its own. If you've ever been on the internet or seen photos of Bali, chances are you have seen this world-famous rice terrace. The Tegallalang Rice Fields are a masterpiece of art as its layered terraces cover the hillside. These Fields are famous for a reason, to say the least. Their beauty almost impossible to capture with any form of art. Hiking along the path through the hillside just added the cherry on top to this magical masterpiece. I decided to take a couple day break from Bali's glory and take an "Island time"1-hour boat ride to a divers dream island; long story short I ended up soaking wet on Gili Trawangan two and a half hours later. Word of advice: don't sit on top of the boat with all of your non-waterproof luggage. Chanting echoes around the island through mosques almost all hours of the day and night. For a Muslim island, this was to be expected. It was almost relieving knowing a hint of their culture still exists, despite my many sleepless nights. This island is so small that walking around it takes no more than a couple of hours. Built like a maze, small dirt streets and alleyways are flooded with dust blown up by passing mules with carriages and tourist bikes. (I did not use the mules, I have some issues with the way they are treated). The heat on the island gets to most people so swimsuits seem to be an everyday outfit. I learned the hard way not to wear white, but least it looked like I had finally gotten a tan! Gili T went by quickly. Spending my days snorkeling, tanning and walking around the little village that inhabited this small island I was living in paradise. Gili T may be known for diving but this is a sunset chasers dream island. Imagine popping a beer, listening to a live dj, laughing with your friends, ocean waves, and an electric sky full of vibrant pinks, oranges, and reds. PARADISE. All I really can say is I felt complete, full of love, passion and I was living my dream.